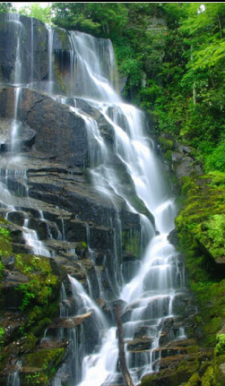 This falls starts with a short drop, which goes into a very long, gentle slide into a deep pool. 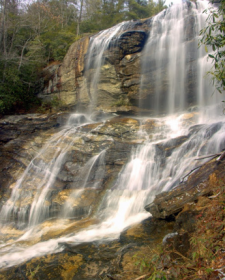 The Spectacular Mingo Falls located in Cherokee, NC are over 120 feet high and are rated one of the most impressive falls in Western North Carolina. Water is one thing there is not a shortage of when you come to the mountains of Western North Carolina. 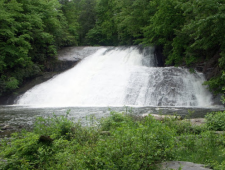 Glen Falls is three tiers of 70, 60, and 15 feet in height for a total of about 145 feet of falling water. 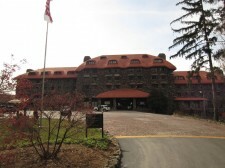 The Grove Park Inn is a Beautiful Resort and Spa that attract thousands of visitors every year. 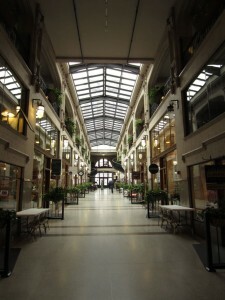 A historic shopping center located downtown Asheville that is famous for its beautifully restored architecture from the 1920s. 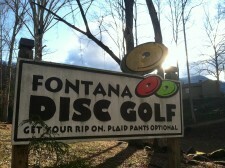 Disc Golf is an activity that is quickly on the rise in Western North Carolina. 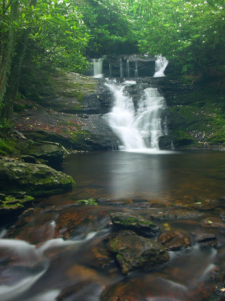 Located right in between a state and national forest, and surrounded by waterfalls, Brevard is another great city where the outdoors are just minutes away. 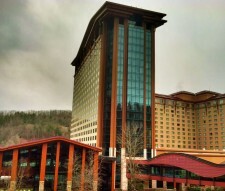 If the casino is too big for you then try your luck at Cherokee’s Tribal Bingo. Fishing is one of the main activities that brings sportsman both young and old to the area. 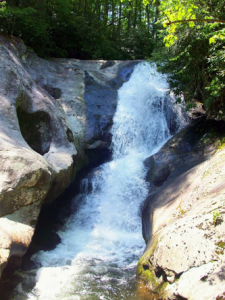 Nature trails, parks and scenic roadways abound in Western NC. 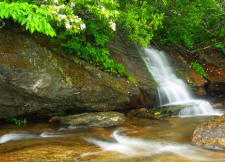 Walk the Appalachian Trail; explore the Great Smoky Mountains National Park, Joyce Kilmer Memorial Forest, Nantahala National Forest, or Pisgah National Forest; or drive the Blue Ridge Parkway, Cherohala Skyway, or Mountain Waters Scenic Byway. There is fun for everyone in Western NC. There are many pristine lakes that can be enjoyed by boaters, wake-boarders, water skiers, or just lake lovers. Do you get a hint of what this place serves from the name? Well, you should because they serve up fried goodness every day of the week. Saddle up for some of the most beautiful horseback ridding that you have ever done! The Brown Mountain Lights create an uncanny light show that has been described in many ways from being like a glowing ball of fire, to being a bursting skyrocket, or a pale almost white light. 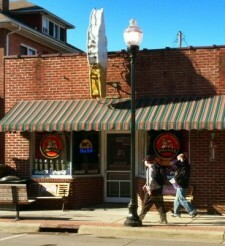 A community that takes pride in it’s small hometown atmosphere makes Canton a city full of heritage and history. 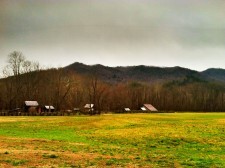 Hayesville in known as “The Best Kept Secret in North Carolina” by Western North Carolina locals, and rightly so. 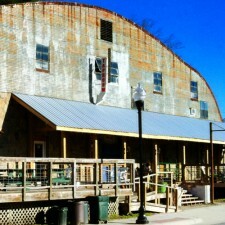 Bryson City’s most unique ice cream parlor takes you beck to the old days right when you step foot inside the door. Surrounded by the Appalachian mountains Waynesville has so much to offer within a short drive from outdoor activities to shopping and dinning. 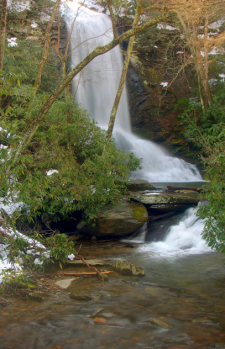 Known as the “Little Charleston of the Mountains”, Flat Rock is a small community filled with historic inns, shops, restaurants, and galleries that will keep you exploring the area for days. 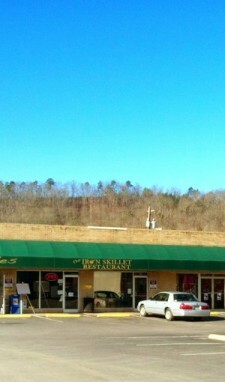 Offering up Italian favorites to locals and visitors to Bryson City, NC. 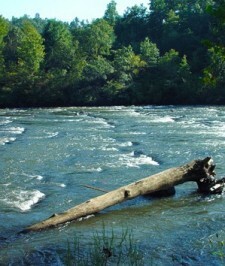 In Western North Carolina you will be able to find a very calm river or one that is a little more raging, depending on what suits you best. 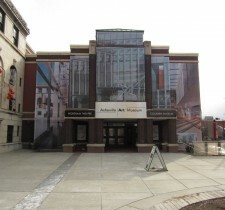 The Asheville Art Museum is the single visual arts facility serving Western North Carolina. Asheville, NC – This 18 hole disc golf course is one of the most played courses in Asheville. It features a wide range of obstacles and is pretty difficult as you throw through the woods, over valleys, and down ridges. The falls are not tall, but they are pretty, and spill into a neat little pool. 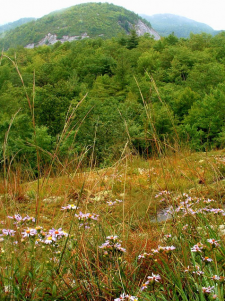 The Panthertown Valley is one of those unique places that are well revered by hiking and outdoor enthusiasts, as well as ecologists, in the Southern Appalachian mountains. The Great Smoky Mountains National Park, established in 1934, covers 520,408 acres of land with heights ranging from 840 feet at Abrams Creek to 6,643 feet at Clingmans Dome. 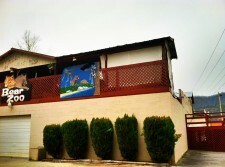 Located in the heart of Asheville, North Carolina is educational Pack Place. 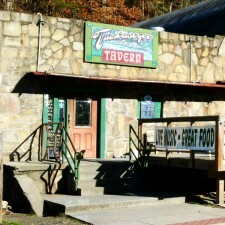 The Tavern is where you go to get served up some pub style food in Bryson City. A great small town experience in the heart of the Appalachian mountains. The ultimate Western North Carolina destination for gambling and late night entertainment. 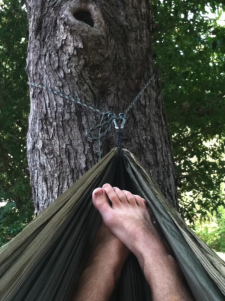 The number one choice for accommodations is Western North Carolina is the great outdoors! Located in the foothills of the Great Smoky Mountains, Franklin is a city filled with many things to do for the whole family within the city. 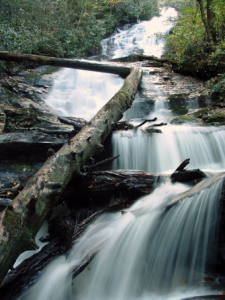 The Cradle of Forestry in America is a 6,500 acre Historic Site within the Pisgah National Forest. Located on a 42-acre Natural Heritage site the center has many species of wildlife, gardens, trails, indoor exhibits and farm animals. Some of the most beautiful golf courses you will ever play on can be found amongst the mountains and valleys of Western North Carolina. There are many great rock faces to scramble up in the Western North Carolina area. A neat sliding cascade, which drops into a huge, deep pool. This beautiful distinguished city is full of upscale dinning and shopping locations and surrounded by some of the south’s most prestigious golf clubs. The highest dam east of the Rockies is located just 35 miles West of Bryson City, North Carolina. 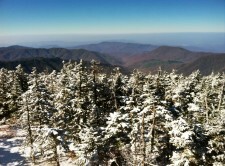 Rising 6,643 feet above the Great Smoky Mountains, Clingman’s Dome is the highest point along the Appalachian Trail and provides a 360 degree view of the surrounding mountains. Cabins in the Appalachian, Blue Ridge and Great Smoky Mountains of North Carolina are as unique as each family who owns them. 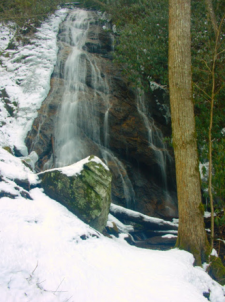 A small but beautiful waterfall that is located only a few minutes hike form the Deep Creek Parking Area. Dillsboro is a small city where you can take a step back in time and tour around the downtown area visiting shops, restaurants, and art galleries that are held within historic buildings. Darnell Farms offers many weekend festivals: Strawberry Jam Festival, Tomatoefest and Timberfest plus a Corn Maze depending on the season. A scenic roadway, which travels 469 miles to connect the Shenandoah National Park in Virginia with the Great Smoky Mountains National Park in North Carolina and Tennessee. 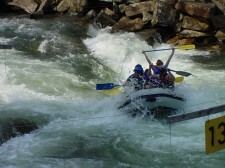 For great family rafting fun enjoy the Class I rapids of the Tuckaseigee River. 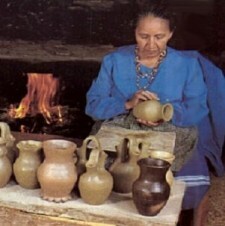 This village is an authentic replica of an 18th century Cherokee community. Discover America’s largest home, magnificent gardens, award-winning winery, great shopping and delicious dining. 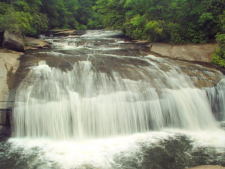 The Nantahala River offers the thrill and excitement of riding river rapids in a raft, canoe or kayak while enjoying the scenic Nantahala National Forest that surrounds it. 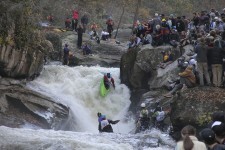 Western North Carolina is a special place in the kayaking world. Visiting Weaverville means having a chance for you and your family to experience life at a slower pace. Some consider this the highest waterfall east of the Mississippi River. Charlies Bunion is a mountain in the Great Smoky Mountains National Park, characterized by a large boulder-like protrusion just below the summit on its otherwise-sheer northern face. Visitors are invited to view their family tartan, connect with their clan, and learn about the history of Highland Dress. 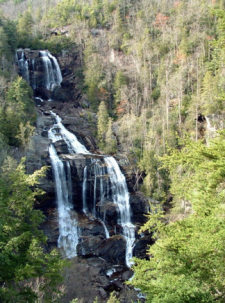 An attractive, two-tiered cascade with some free-falling sections, across tilted rocks. North Carolina’s longest trail, the North Carolina Mountains to Sea Trail, is an ambitious project to provide a foot path linking the Mountains in the West to the Coastal Plain in the East. 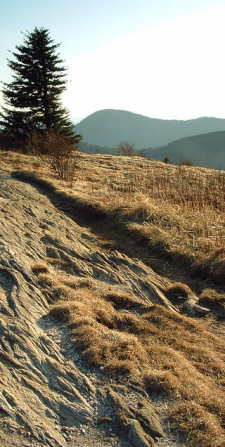 The Appalachian National Scenic Trail is a 2,159.1-mile foot trail along the ridge crests and through the major valleys of the Appalachian Mountains. The Diner, as locals refer to it has been serving up traditional breakfast dishes and lunch specials to patrons for many years. 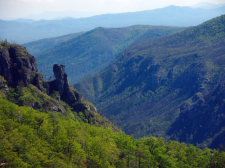 A privately owned National Heritage Site, Chimney Rock Park encompasses 1000 acres, including rock formation seen here with a 360 degree view of the Blue Ridge Mountains. 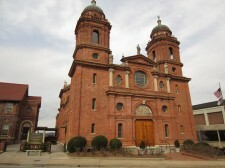 The St. Lawrence Basilica is a beautiful and historic part of Asheville. 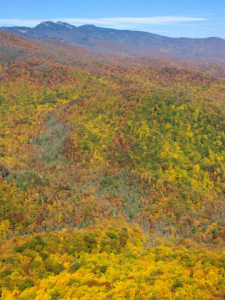 At 5,964 feet above sea level, Grandfather Mountain is the highest peak in the Blue Ridge Mountain Range and the only private park in the world. 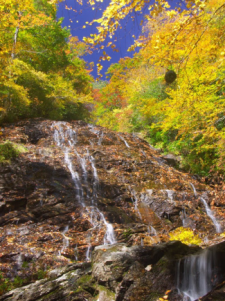 Averaging 1,400′ deep, the Linville Gorge was carved by the Linville River on its way down the Blue Ridge Escarpment. 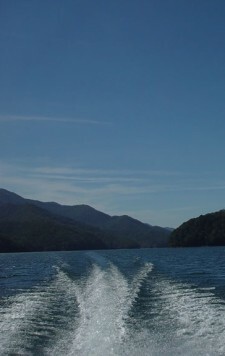 Tsali has 39 miles of trails in a four loop system that wind around the Fontana Lake and through US Forest Service Land. This is an a small, steep, attractive cascade surrounded by laurel and rhododendron. Surrounded by mountains exceeding 6000′ in elevation, the base of the valley is itself over 5000′, which accounts for some of its unique characteristics. 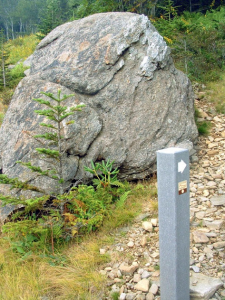 A variety of hiking trails wind throughout the valley for your exploration. 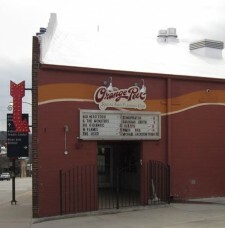 Asheville hottest music venue and social club. 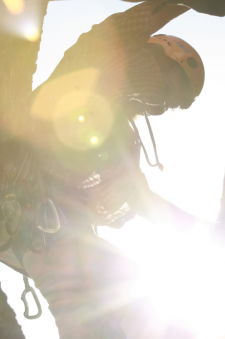 Enjoy a soaring and gliding experience naturally fueled by a gradual elevation change at Nantahala Gorge Canopy Tours. 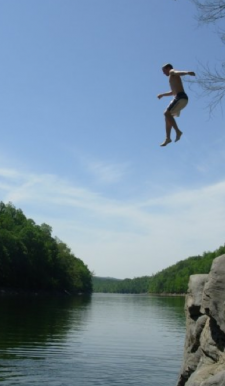 A mecca for outdoor adventure lovers makes Boone a great place to visit and live. This is a long tumbling cascade and slide, with a few free falling sections. The historic town of Hendersonville offers visitors many different recreational activities for the entire family, along with local festivals that will satisfy any apple craving you have ever had. 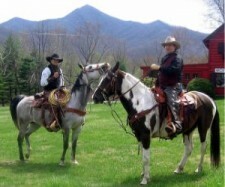 Pisgah View Ranch is a Western North Carolina Dude Ranch that offers a horse ranch get a way for Family and Guests. 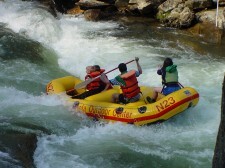 This very popular activity is mainly enjoyed in the water of Deep Creek in the Great Smoky Mountains National Park. Serving up breakfast, lunch, and dinner to locals and visitors weekly. Bridal Veil Falls is unique in that you can drive behind them. US Hwy. 64 used to pass behind the falls until it was rerouted in front of the falls for safety. Cherokee Bear Zoo & Exotic Animals is the home of many native Black Bears along with non-native Grizzlies, Lemurs, a Tiger, and a Monkey. 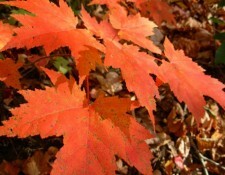 The 4500-acre Needmore Tract was purchased by the State of North Carolina in January of 2004 as a nature preserve. A high, cascading slide in an pretty cove. 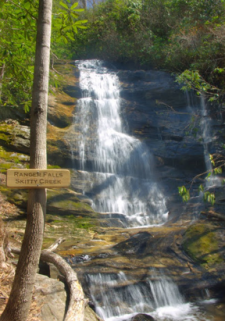 This falls is named for its shape, sort of like the domed shell of a turtle. It drops into a deep pool and some people use it for sliding. The Mountain Farm Museum has a collection of southern Appalachian farm buildings assembled from different locations throughout the Park. 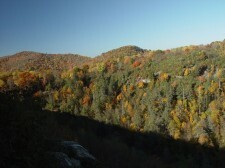 Shining Rock became one of the original components of the Wilderness System in September 1964. 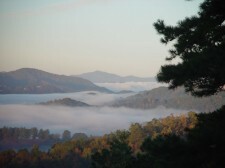 It is the largest Wilderness area in North Carolina. These trails travel along the shores and hills beside Lake Chatuge, and all trails are open to mountain biking and hiking. 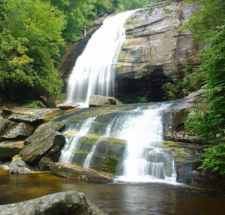 Offers trips that encompass everything that’s great about Western North Carolina-hiking, picnicking, swimming, and a thrilling jet boat ride. Waterfalls and many cascades are located in the Great Smoky Mountains National Park, the Nantahala National Forest, around the Blue Ridge Parkway in the Pisgah National Forest and the Appalachian mountains of Western North Carolina, including the 411 feet Whitewater Falls which is the tallest series of falls east of the Mississippi. Situated in a valley surrounded by the Smoky Mountains, Maggie Valley is a fun city to visit for the entire family. 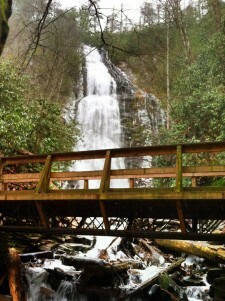 A combination of free falls and cascades. This is one of the most photogenic waterfalls around. 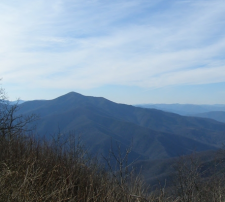 The Black Balsam area includes some of the most spectacular mountain balds in the Southern Appalachians, including Black Balsam Knob, Sam Knob, and Tennent Mountain. 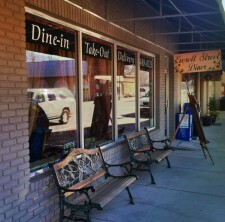 A historic coffee shop located on Broadway. The fresh smell of hops and everything else that goes in to a great craft beer fill the air when you approach doors of the Nantahala Brewery. 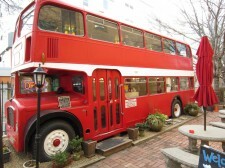 The Choo Choo Coffee Company is not just a coffee shop, it offers much more than that to its patrons. 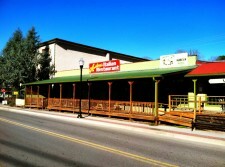 A unique sandwich shop located in the heart of downtown Bryson City, where a wide variety menu serving up signature deli sandwiches, salad, soups, and more can be found. A beauty worth visiting. 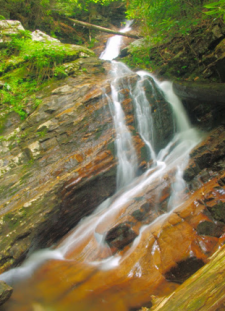 A steep cascade drops over a ledge onto an outcrop among boulders before shifting right, and dropping over another, smaller, cascade into a deep and wide pool. A small mountain town rich with history and a love for the mountains that surrounded it. This waterfall is a narrow tumble and cascade into a deep trough, that opens up and spills out into a deep pool – a fantastic swimming hole (if the water isn’t super high). This small town located in the heart of the Great Smoky Mountains National Park is literally a ‘base camp” for anything outdoor related. This city is set up beautifully along the banks of Lake Lure, offering visitors a great balance between outdoor adventure, rest, and relaxation.